There's actually a little bit to report tonight, as I had some problems with my hardware and didn't have the playoff pool available to me until tonight. As you can see there is a little bit of a difference in the pool standings, as the Destroyers have moved even further ahead and Red, White & Blue, the only team in the pool with zero players left is now two points away from permanently being in last place. Ouch. So... I guess I'll have to start with Game 4 in the East. The Sabres were looking to pull ahead in the series 3-1, but the Hurricanes and Martin Gerber had other ideas... namely a 4-0 decision to tie the series up at 2 games a piece. Gerber's first start in just over a month paid immediate dividends to the Hurricane cause on Friday night. His 22 save effort earned him a solid four-point decision and finally became the big player that six pool teams thought he would be. The other multi-point 'Canes were Mark Recchi, who got the bonus point for his opening score, which turned out to be the winner, and Bret Hedican who added a goal and an assist. Eric Staal extended his point streak to 14 games with the other pool counting goal, while Frank Kaberle, Aaron Ward, Ray Whitney, Doug Weight, Justin Williams & Cory Stillman all added assists for the pool's cause as well. Yup... the Mighty Ducks are finished in these playoffs. Anaheim couldn't climb back into the series at home in Game 5 on Saturday night. 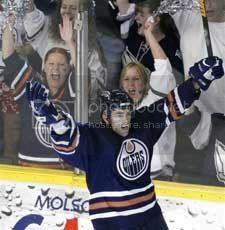 The Oilers won the game 2-1 and sent the Edmonton faithful into a frenzy, as this will be the first final for the Oilers since 1990. Dwayne Roloson again was a stalwart in the net for Edmonton making 32 saves and despite giving up the first goal of the game. His 28 points now extends his pool lead in points and the Destroyers are still the only team to cash in on him. Unfortunately, for the Oil-favouring pool picks, there were only two assists from the Oilers' 2 goals that counted. Marc-Andre Bergeron and Shawn Horcoff each recorded points on the two goals, scored by Ehtan Moreau and Raffi Torres, neither of which were on the selection sheet. But now they'll all get to rest up, including those pool players, as they've had enough hockey to tire out the best of the marathon runners. At least a six-day rest is in their calendar as the Finals won't start until at least the 3rd of June. As for the Ducks, they only registered two assists in the pool in the loss. Scott Niedermayer and Teemu Selanne registered their last two points in the pool in the loss. The Ducks were not a substantial force in the pool points-wise... but they were for knocking out some of the big teams before getting eliminated. They were responsible for 117 selections being taken out of the pool, in Calgary and Colorado picks, but there were only 22 Ducks picked to make a run. Sunday night... Game 5 in the East. The pivotal game that neither team wanted to lose. No one wanted to face elimination in Buffalo on Tuesday, so the pivot was then set in Game 5. Martin Gerber started his second consecutive game and Ryan Miller started yet again for the Sabres. 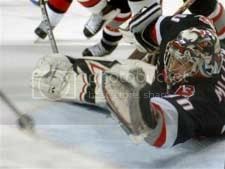 But it was neither or the starting goalies that would get the better of decisions... rather Gerber was pulled in the second after going down 3-1 and Cam Ward came in to salvage a 4-3 overtime win in Game 5. Ward came in and made 15 saves in the last 46 minutes of the game, including overtime for his 10th win in the playoffs. Now the Hurricanes are just one win away from meeting the Oilers in the Finals. Cory Stillman had 3 points, including the winner and an assist in the game to be the big gamer for the Hurricanes. Mark Recchi had another goal, Doug Weight, Frank Kaberle & Ray Whitney each added assists as well. Eric Staal also had an assist to extend his scoring streak up to 15 games in these playoffs. He's also the leading point skater in the pool. 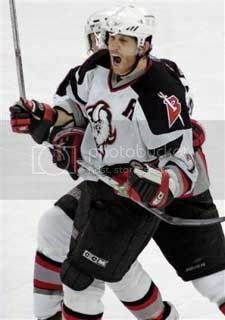 For the Sabres, Chris Drury & Toni Lydman each had a goal and Jay McKee had the only other pool worthy assist in the game. The Sabres will look to even the series on Tuesday in Buffalo in Game 6. Ducks 6 Oilers 3... Game 5, Here We Come. The lead has been stretched to 10 points... and it gets worse. There will be another game for the Oilers to score some points, which isn't good news for the Halos. The Halos didn't need an opportunity for the Destroyers to cash in on big Oiler points yet again. The series isn't over yet. The Mighty Ducks through the kitchen sink at the Oilers and that seemed to distract the Edmonton-faithful enough to stop any rioting in the streets last night. The series will shift back down to Anaheim for Game 5 on Saturday. It will be a 7pm start on CBC on Saturday night. Remember Jean-Sebastien Giguere? Yeah, he started the first few games of the playoffs against the Flames for the Ducks. Would you believe he came back in to the crease for the Ducks and got credit for the win? Well... he did. And it was his 3rd win for him in the playoffs and believe it or not... there is a team in the pool, Rick's Red, who have him too. Unfortunately, they are not in the Top 10... rather Rick's Red, if they had Bryzgalov's 18 points, they would be... still not in the Top 10. Anyways... Ruslan Salei was the big bonus winner for the Ducks, scoring the winning goal, 5:42 in the 2nd period. Joffrey Lupul had a pair of goals and Ryan Getzlaf had a goal and an assist to sum up all the multi-point players for the Ducks. Teemu Selanne, Scott Niedermayer & Sean O'Donnell all had points as well for the Ducks. Ryan Smyth & Marc-Andre Bergeron scored a goal each for the Oilers in the loss last night, whilst Chris Pronger had a pair of assists and Shawn Horcoff & Sergei Samsonov each had one of their own. The lead remains at eight points going into, what possibly could be, the series decider in Edmonton on Thursday night. But it was the Hurricanes and Sabres providing the entertainment last night... and a few more points. Game 3 went off, much like the first two in the series. The eventual winning team would amass a lead and then defend it to the bitter end. Buffalo was no different, winning 4-3 in dramatic fashion, yet again. Ryan Miller won his 10th game of the playoffs, making 24 saves in the effort. He is now in 2nd overall in pool players for points with 22. The bonus point went to Ales Kotalik scoring Buffalo's fourth goal and then adding an assist on their first goal. Daniel Briere scored a pair of goals for the Sabres, he's now up to 7 in the playoffs. J.P. Dumont tallied a pair of assists in the win as well. Other single-point getters for the winners include, Jochen Hecht, Jay McKee, Chris Drury, Maxim Afinogenov & Toni Lydman. For the Hurricanes, Cory Stillman had a pair of goals as the only multi-point player on their side. Eric Staal scored the other goal, while Aaron Ward, Justin Williams, Doug Weight & Frank Kaberle all had assists on the goals. The series continues in Buffalo on Friday night. This series is far from over. Saying that, the top two teams will remain somewhat interesting. If the Dewhirst Destroyers are to have the Oilers eliminate the Ducks tonight, then 3 of their 10 guys will not play again until the Oilers meet whomever wins in the East. So... if Buffalo and Carolina goes for a while and Daniel Briere, the best Eastern Conference centre in the pool, keeps the Sabres in it with his scoring touch, then the Halos have a small chance of pulling some points back, since each team have two different Hurricanes each. The lead was increased by the marquee game for the Destroyers. A gain of 4 points on the Halos was welcomed by the Destroyers last night, while points from the Ducks helped NO SHOOTOUTS to pull away in 3rd. I bet at the beginning of the game that all the penalty minutes would have counted in the pool, eh?? The Ducks were in pretty deep losing the first two games at home to Edmonton, having to go to Rexall Place... and despite the huge effort early in the 3rd by the Oilers, the Ducks made a game of it. But for Oilers fans, the rollercoaster ride finished on a positive note, winning 5-4. Despite the five goals for Edmonton, most points were captured by non-pool players, limiting the points that were gained and/or lost in the Standings. Dwayne Roloson continued to roll, winning his 7th straight game. Sergei Samsonov had a pair of assists. And the only other two points from the Oilers... Chris Pronger had a goal and Jaroslav Spacek had an assist. That's it. For the Mighty Ducks, Teemu Selanne had a pair of goals, Sean O'Donnell had a goal and Scott Niedermayer, Ryan Getzlaf, Vitaly Vishnevski & Joffrey Lupul all had assists. Game 4 will go on Thursday to try and close out the series. Game 2 in the East panned out the way it probably should... as the evenly matched pair of teams bring their series to a draw. Sadly, it didn't have quite the same effect on the pool as our new leaders, the Dewhirst Destroyers, have kept their four-point lead going into Edmonton & Anaheim's 3rd game tonight. Carolina did much like Buffalo did in the first game... build itself a lead and hang on for dear life as the other team chips away at you... still managing to hang on. Cam Ward won game number 9 for the Hurricanes after only making 16 saves in the 4-3 win. You can't really say that he was tested a great deal... 6 shots in the 1st, 4 in the 2nd and 9 in the 3rd. Justin Williams scored the winning goal 7 minutes into the 3rd period, building a 4-1 lead, but was the eventual winner. Ray Whitney (pictured) scored a pair of goals and Frank Kaberle opened the scoring in the game. Cory Stillman, Eric Staal, Doug Weight all had pool worthy assists in Game 2 as well. For the Sabres, Chris Drury had a goal and an assist on the comeback trail. Ales Kotalik, Daniel Briere, J.P. Dumont and Maxim Afinogenov all had assists in the game. The series will now shift back to Buffalo on Wednesday. The heading is true... the Dewhirst Destroyers have now claimed top spot with the results over the weekend. A favourable 2-0 series lead for the Oilers saw the Destroyers pick up enough points to take on their rival Halos and still pull away further from the pack behind them. Already moving out to a 6-pont lead does give an indication that it'll be hard, if not impossible, for the Halos to sort of recover from this lack of players. The Oilers doing so well should mean big things for the Destroyers... it's looking like the end of any competition in this pool. On Friday night, the Oilers got right back into their playoff run when they took on the Mighty Ducks of Anaheim at the Arrowhead Pond in California. A very tight-checking game for the most part saw the Oilers slip past the Ducks 3-1 to take a 1-0 series lead. Dwayne Roloson had the biggest game of all the players, registering a win and adding an assist for a 3-point night. He had flipped a huge pass down the ice to Mike Peca to open the scoring for the Oilers and claim his first assist of the post-season. Ales Hemsky was the only Oil goal scorer to register his goal in the pool and luckily for him, it was the game-winner. 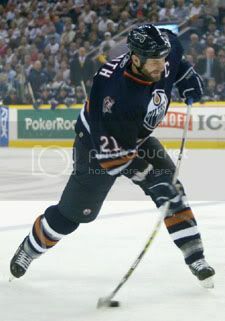 Other point getters for the Oilers were Ryan Smyth, Chris Pronger and Shawn Horcoff, each having an assist. Scott Niedermayer had the only point for the pool-worthy Ducks. The Ducks just couldn't manage to get any offense generated against the rolling Oilers. The Saturday matinee saw a very fast-paced game with lots of action and a tight finish, which sets the stage for a pretty exciting series. The Buffalo Sabres hung on to beat the Carolina Hurricanes in the Eastern Conference Final Game 1 3-2 to take the 1-0 series lead. Jay McKee scored the eventual winning goal, his second goal of these playoffs to lead the Sabres to victory. Ryan Miller made 29 saves for his 9th win of the playoffs. Jochen Hecht had a pair of assists in the victory. Daniel Briere added the 2nd goal for the Sabres and that was the only other Sabre point recorded. No goals were counted for Hurricane pool players, but Bret Hedican, Cory Stillman & Eric Staal all recorded assists for the pool's cause. Sunday night saw Game 2 in Anaheim between the Ducks & Oilers and shockingly, it was a lot like a repeat performance of Friday night. It was another 3-1 win for the Oilers, to go up 2-0 in the series, but that's not where it stopped either. Dwayne Roloson had the win and yet ANOTHER assist on a Mike Peca goal, which gives the Oilers netminder a whopping 24 points to lead all players in the pool. 10 wins, a shutout and 2 assists leads the way in the pool... taken only once... by the leader. Chris Pronger had a goal and Ales Hemsky, Ryan Smyth & Sergei Samsonov all added assists for the pool in the win as well. Jeff Friesen scored from Samuel Pahlsson and Rob Niedermayer for the Ducks only goal on Sunday. The run for the Sharks is over. The two top scorers in the league have been eliminated from the playoffs and from a lot of teams in the pool. The Oilers shut out the Sharks 2-0 to win the series 4 games to 2 and will move on to face the Anaheim Mighty Ducks in the Western Conference Finals. Dwayne Roloson earned his first shutout of the playoffs, which was a huge 4-point game for him. Mike Peca, a non-pool participant, scored the winning goal, unassisted... spoil sport. But the second goal was scored by Shawn Horcoff from Todd Harvey and Ryan Smyth. For the Sharks, they leave the playoffs after a high-scoring regular season and first round of the playoffs. Unfortunately, when the Oilers' fortunes turned for the better, the Sharks couldn't find theirs again and thus lost the series in a tailspin. Well, there isn't a lot of players left now whom are still active and there certainly wasn't a lot of people banking on the Oilers to make it very far... hell, they had to face the Red Wings to start and then the high-flying Sharks in the second round... but here they are. The Oilers were the least selected of the playoff-bound teams, with only 13 selections and the Dewhirst Destroyers are the only team with 3 Oilers on his selection sheet. Oiler players are also the top scoring bunch in the pool, with a combined 101 points between everyone on the sheet. Makes you wish you had some, doesn't it? The Mighty Ducks will host the Oilers on Friday night, puck drop is at 7pm MT and should be on CBC. The Ducks have played some very good hockey so far in the playoffs, eliminating the Flames (quack!) in seven and then sweeping the Avalanche out as well. For the pool, there were only 22 x's marked in Anaheim boxes on all the selection sheets, which isn't many more than Edmonton's 13, so there won't be very many people claiming a whole lot of points from this series. Rick's Red leads the pool in Ducks with the maximum of 3... while the lead-chasing Dewhirst Destroyers leads the pool in Oilers with his 3. The question is... will Ducks be a tad water-logged after sitting in the pond too long, waiting for their next opponent? On Saturday afternoon, Carolina will host Buffalo in the Eastern semi-final. There's no question that both these teams were a little more popular, being higher seeds in their respective Conference, much unlike their Western counterparts. There were 90 Hurricane selections and 50 Sabre selections... which kind of leads you to believe that if there is still some people cheering on in this pool, that they'll be looking at the Hurricanes to do well. Both teams in this series had near-equal amounts of rest, so when the puck drops at 2pm on Saturday, they should all be well-rested and ready to go. The Hurricanes did it. They elminated the Devils in five games, moving on to face the Buffalo Sabres in the Conference Finals. They managed to stop, what once was, a surging Devils team and stop them in their tracks with great intent. 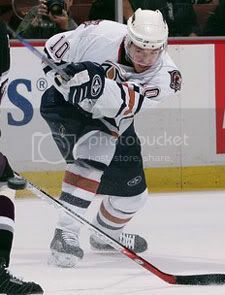 In the finale, Cory Stillman scored the winning goal for the Hurricanes, Mark Recchi had two assists and Frank Kaberle, Eric Staal, Ray Whitney, Dough Weight and Justin Williams all recorded a single point each. The last game for the Devils only saw them score one goal... Brian Gionta from Zach Parise and Brian Rafalski. Not a very meaningful set a points from the last of the Devils. What can ya say? The Oilers are on a roll. Scoring 12 goals in their last two games means that they've found a way to get shots past Vesa Toskala after being stymied in the first two games of the season. It was a multiple-point haven for the Oilers... Ryan Smyth led the pool players with 2 goals and 2 assists, Shawn Horcoff had a goal and 2 assists, Jaroslav Spacek, Ales Hemsky & Chris Pronger all had 2 assists and the winning goalie, Dwayne Roloson had a pair of points for the win. The lead for the pool has been cut down from 15 to 8 points... thanks to the big Oilers win. For the Sharks, Christian Ehrhoff had a goal and an assist, whilst Patrick Marleau, Joe Thornton, Ville Nieminen & Jonathon Cheechoo all had single points as well. There is still at least one more game left in the series... two, if the Sharks win on Wednesday night (8pm on CBC). Well, growing closer to the third round, it looks like this pool is becoming a two-horse race. The Halos are running away from Dewhirst Destroyers... but you can't count anyone out just yet. The Anaheim Mighty Ducks are already through... and between two the two leaders, there are a few ducks to speak of. The leading Halos will rely on his defensemen choices in Sean O'Donnell and Vitaly Vishnevski to pick up a few points here and there. The Dewhirst Destroyers have the bulk of the scoring from Anaheim in Teemu Selanne and Scott Niedermayer. All players are going to get a good rest when they face the winner of the other conference semi-final. The other team already through to the Conference Finals is the Buffalo Sabres. They are not as well represented as the other NHL teams as Daniel Briere is the only Sabre unique to both teams and he's on the Halos. So, those are both teams who've made it through... and then we look at the series that are not finished and there we see a little bit more difference between our leaders. The other Western Semi-Final has a major difference in pool team players. The Halos are holding onto 2 unique Sharks, while the Destroyers have 3 unique Oilers. Both pool teams have Joe Thornton, so he doesn't really count at all... but the Halos also have Jonathon Cheechoo and Patrick Marleau, so if the Sharks are to win... and win big... then the Halos are pretty much invincible to losing this pool. On the other hand, the Destroyers will rely on Dwayne Roloson, Ryan Smyth and Jaroslav Spacek to beat the Sharks and make more of a closer race in the pool. Both of our leaders are sort of hoping for a Carolina win in Game 5, because they both have more Hurricanes than Devils. But for the Halos, Patrik Elias is on their team as the only unique Devil between the two. If the Devils win another game or two... OR three... then Elias will be one of the big reasons as to why they win. For both teams though, each of them have two unique Canes each... the Halos having Ray Whitney and Oleg Tverdovsky and the Destroyers employing Eric Staal and Frantisek Kaberle. Arguably, Staal is the better of the two scorers and we be much more beneficial in the long run. In closing, the pool will rely mostly on the Edmonton/San Jose series... if San Jose parts with Edmonton, then the Halos have pretty much clinched the $390. That's the series to watch! 93 selections were lost in the 3-2 overtime win for the Sabres to eliminate the Ottawa Senators from post-season contention. The Sabres got through the series 4 games to 1 and will meet the winner of the New Jersey/Carolina series. Chris Drury had a goal and an assist for the Sabres and Ales Kotalik had a pair of assists in the win. Toni Lydman had the only other point from the Sabre skaters in the win. Ryan Miller stood tall and made 34 saves in the win. The Senators had a goal from Daniel Alfredsson and assists from Zdeno Chara, Jason Spezza and Bryan Smolinski. The Senators just couldn't muster any more offense to beat the Sabres and will have all summer to find other ways to get to that ever-elusive Stanley Cup. The Edmonton Oilers found life on Friday night as they evened up the series against San Jose at two-a-piece. The 6-3 game was quite exciting game and keeps a Canadian team in the playoffs with hopes of moving on just a little bit further. Dwayne Roloson won his 6th game of the playoffs, making 22 saves. Jason Smith was credited with the winning goal and also added 2 assists for a 4-point night. Sergei Samsonov had a goal and an assist and Chris Pronger had 2 assists for the only other multi-point Oilers. Now that the Oilers are clicking offensively, they should be a large handful for the Sharks to handle. For the Sharks, Jonathon Cheechoo, Nils Ekman & Joe Thornton each had a goal and an assist. Patrick Marleau also had an assist in the loss. The series now shifts back to San Jose and Game 5 will go Sunday night on CBC at 8pm. The New Jersey Devils have lived to see another game in Carolina. The Devils won this afternoon, 5-1, and will play again on Sunday night. Scott Gomez had a pair of goals, John Madden had a goal and an assist, Brian Rafalski and Patrik Elias each had 2 assists. Elias was originally credited with 3 assists, but had one taken away after the game had finished. Martin Brodeur finally won a game in the series after making 19 saves. The only goal for the Hurricanes was scored by Mark Recchi from Eric Staal and Mike Commodore. At the time of publication, the Senators and Sabres were tied at 2 almost finishing the second period. The stats do not reflect any of the scoring plays so far in the game. NO SHOOTOUTS - REAL HOCKEY!